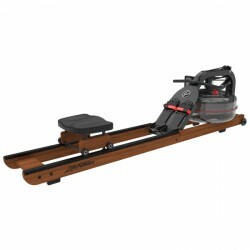 The first LifeFitness wooden rowing machine Row HX combines stylish design with high functionality and durability. It is equipped with a water resistance system and convinces by a smooth, joint-gentle course of motion. The water resistance is adjustable in four levels, the training computer is intuitive, and the sturdy frame construction made of steel guarantees a sturdy stability. Perfect for effective whole body training. Now, WaterRower offers the popular rowing machine with an extremely realistic water resistance in a version of trendy wood oak. Oak is synonymous for stability and quality, it also experiences a renaissance in furniture industry. Rowing ergometer for advanced private use and commercial use! The cardiostrong rowing machine Baltic Rower with water resistance is an ideal beginner rowing machine: the use is quite easy, it can be quickly assembled and adjusted and shows all important training values on the big display. Train almost the whole body and improve your fitness with the rower. 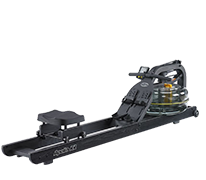 The WaterRower rowing machine Ashwood Natural features incredibly realistic water resistance in a rower-ergometer (with Watt display). Its water wheel lets you row against a natural resistance that can even be varied by changing the amount of water. 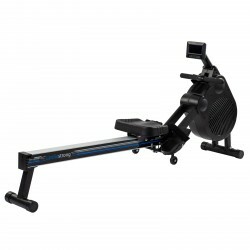 The cardiostrong rowing machine RX40 is a compact and solid rowing machine for home use. 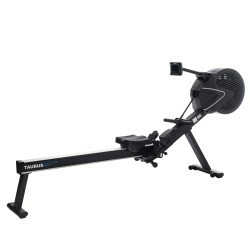 Featuring many exercise programmes and a comfortable rowing stroke, this space-efficient rowing machine is ideally suited for an individual training. Takes small space and I do not have to renounce anything: The RX40 gives all the heart of a rower asks for. 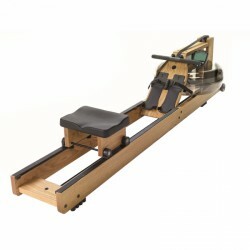 Waterrower rowing machine beech Vintage - Exclusively at Sport-Tiedje! The Waterrower rowing machine beech Vintage offers you highest rowing comfort with an incomparable design and high-quality workmanship. Train against the natural resistance of water and experience an extremely realistic training movement with authentic sound effects. Rowing exercise bike for the upscale private use and commercial use! WaterRower Beech - Exclusively at Sport-Tiedje! 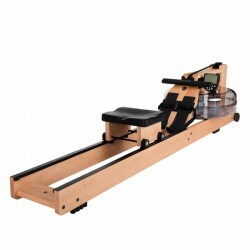 The WaterRower rowing machine Natural Beech features incredibly realistic water resistance in a rower-ergometer (with Watt display). Its water wheel lets you row against a natural resistance that can even be varied by changing the amount of water. Rower exercise bike for upscale private use and commercial use! The WaterRower in beech nature. The resistance system with water feels much more close to reality, even the water sound is calming. And the machines made of wood look the best. 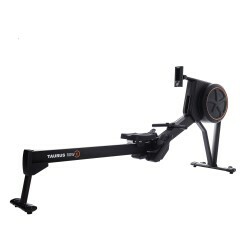 The cardiostrong rowing machine RX50 is a rower of high-quality workmanship with modern equipment. 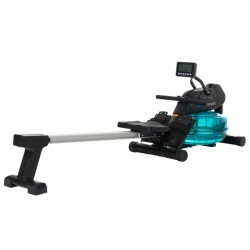 The machine has a combination of air and magnetic brake for powerful and constant strokes. Resistance is variable in 16 levels. The cardiostrong rowing machine RX50 can be comfortably adjusted to different fitness levels and be used by the whole family. WaterRower features incredibly realistic water resistance in a rower-ergometer (with watt display). Its water wheel lets you row against a natural resistance that can even be varied by changing the amount of water. Great machine, simple to operate console, resistance setting is simple and works very well. Self cleaning rails are great, very smooth, design is very quality and low maintenance. Overall quite operation , noisiest part is the moving water in the chamber. Handle is very comfortable, strap as opposed to chain is a winner. 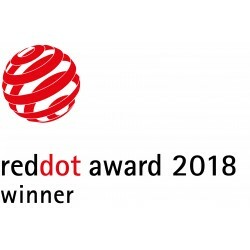 Probably over spec for my own in home use but very happy. Is also very easy to store upright . I am very pleased with this purchase! 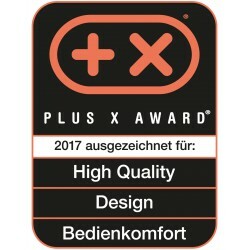 Outstanding service from your customer service and your store in Schleswig, where I collected my purchase, this was a very nice experience, my absolute best recommandations! By the way - the Concept 2 is a super product! I am very pleased with this purchase. The delivery was quick and the set up easy. When it arrived, there was no problem moving it into the small lift up to my apartment. I had read on some reviews that it might not be suitable for use in an apartment block due to noise but I disagree because it is much quieter tah was suggested. 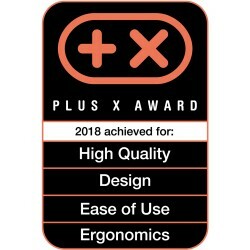 The quality of this product use excellent. Although early days, I am feeling more fit than before from using this for 20 minutes every other day. Like most equipment it offers a lot more than I have been able to take advantage of so far. I can‘t think of think of any disadvantages of this product. I would certainly recommend this piece of equipment to improve general fitness. Finally, it is simple to collapse if storage space is an issue and makes it an excellent purchase for an apartment. Having such a great piece of equipment in the home means that I get to use it more regularly than had I chosen the alternative, namely trying to go to a gym which I often found difficult to do often. 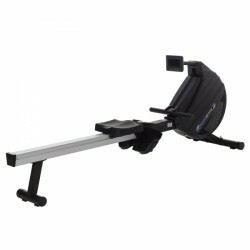 I am a member of a rowing club and we use Concept 2 ergos to train, hence my decision to buy one for use at home. For me, this is the gold standard of rowing machines. I have used others and the Concept 2 feels the most like rowing on the water. Its well constructed,durable and feels solid, even when you are putting in a lot of effort. It takes about 15 mins to assemble at first and can be simply broken into 2 pieces if needed when not being used. The PM5 computer offers several interesting ways of training. Is this the best rowing machine for me. 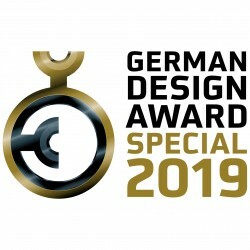 Very nice service from Sport-Tiedje. Beautifully engineered, easy setup and works flawlessly. Very happy with this rower! Fijne roeier, makkelijk opklapbaar. Gebruiks vriendelijk. The instructions of how to assemble it can be confusing. But the machine itself is awesome! Hardly any other stamina sport demands so many muscles like rowing. About 80% of the body muscles are trained doing a complete rowing movement: the legs are angled and stretched, the torso is bent and actively leant back, the arms do the rest. Keeping in mind that not only legs, back and arms are used, but shoulders, abs, and gluteal muscles are activated as well, rowing is meant to be a complete whole-body training. Besides strengthening the muscles, the musculoskeletal system and improving the posture, rowing also trains the cardiovascular system and the stamina. 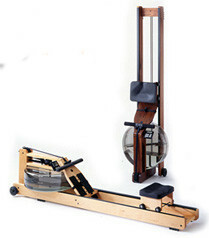 In addition, many persons use a rowing machine to stimulate especially the fat burning. Because many muscle groups are demanded for the course of motion, a rowing machine is considered as a real "calory burn machine". Like swimming or training on an elliptical cross trainer, ergometer or bike, rowing is also one of the most joint-gentle kinds of sport. Due to the smooth movement, the joints do not face any jerky push movements. In view of the fact that rowing machines are suitable for an effective and joint-gentle whole body training, independent of age and fitness level, they have become approved in rehab and prevention as well as at thousands of private households. Compared to rowing in the open air, you can train with an indoor rowing machine also at home at every time and no matter what's the weather. A rowing machine is not a rowing machine. Rowing machines differ mainly in their design. On principle, the rowing machines with are available with cantilever or cable pull system. Rowing machines with cantilever technology feature separate left-right-handles. Though it looks like rowing on water, the cantilever models are not very recommendable even for rowing beginners due to their inharmonic courses of motion and unbalanced resistance effects. In addition, the frequently used hydraulic resistance cylinders are quickly worn, so that these rowing machines do not make a lot of fun. It's very different for rowing machines with cable pull system. Together with a rolling seat quickly and smoothly sliding over the rails, this construction allows a balanced and long stretched rowing movement is made possible - where a cable pull hand is pulled with both hands. The other big difference between the indoor rowers is the brake system. Besides the already mentioned hydraulic cylinders, the magnetic brake or eddy current brake - like it is often found with other fitness machines like exercise bike or elliptical cross trainer - are really wide-spread as resistance system. Compared to the magnetic brake, rowing machines with eddy current brake offer an even more precise resistance setting and, in general, a higher maximum resistance. 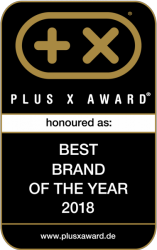 Thus, they are mainly used for the middle or higher price category. The strokes of both brakes systems are considered to be smooth: As measured by the effort, one stroke is similar to the next (for unchanged resistance setting). An absolutely realistic rowing experience is achieved by a system that uses water as resistance. A rowing machine with water resistance system simulates precisely rowing in the open nature. Because the resistance is varied by the water filling volume in the water tank and the individual traction of every stroke: The more intensive the stroke, the more resistance is generated. Thus, the user determines the intensity individually with every stroke – either very light or very hard. In contrast to a rowing machine with magnetic brake system, the water wheel principle minimizes the risk to make a wrong setting of the resistance. Another advantage of water as resistance element is that you hear a pleasant babbling for every stroke. Consequently rowing with a water resistance system is noticeably close to the original sport. Besides that there are also rowing machines which work similarly. Here, the brake effect is not regulated by water but by air. 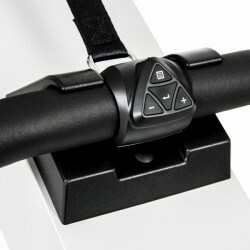 A rowing machine with air resistance sytsem also allows smooth and jerk-free strokes. Depending upon the model, the airflow generated with every stroke might refresh the user but also reduce the silence. On the other hand there are continuously improved rowing machines, which combine the advantages of the air-resistance system with those of the magnetic or eddy current brake systeM. The resistance levels of these so-called hybrid rowing machines is either frequently electronically preset via the handle or the resistance works depending upon the traction. A hybrid rowing machine is suitable for easy starting with rowing training as well as for the advanced workout of rowing enthusiasts. The combi resistance system allow perfect stroke movements for low as well as maximum load. Besides the brake system, there are further - partially - big differences between rowing machines. Regarding stability of a rowing machine, the frame design is important. In general, the frame of a rowing machine, where the sliding seat runs ona double rail, is more stable than that with a mono rail. The own weight and the size of the floor space influence the sturdiness and safety. All in all: The more stable a rowing machine, the higher is the maximum weight loadability and the more durable is the machine. Rowing machines with high stability are much safer for intensive training sessions with powerful strokes. Further distinctive differences concern the general equipment of a rowing machine. A big, well readable, easy-to-use training computer increases the training comfort enormously. 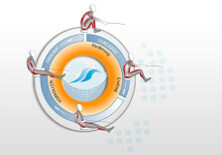 In this respect, rowing machines with training computer are recommendable, which offer a large number of training programmes. In addition, they provide a lot of diversion and increase the motivation for a long time to use the rowing machine regularly and achieve the set fitness targets. 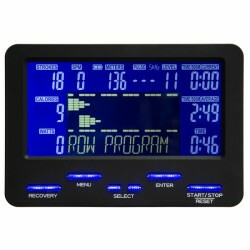 Furthermore, some indoor rowers offer a pc interface for direct connection with the computer at home in order to use respective rowing software programmes. That way, i. e., workouts can be analysed more in detail. Depending upon the model, training data can be transmitted from the training computer to a mobile memory device (USB stick). That's very advantageous, when you train elsewhere with a compatible rowing machine, i. e., at the gym, the rehab or on holiday. 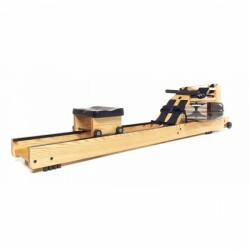 Apart from rowing machines with electronic magnetic brake or eddy current brake, the rowing machines with air and water resistance system do not need to be connected to the power supply. Thus these rowing machines are ideal for commercial facilities or home sportsmen, who want to place their rowing machine freely in the living space. A maximum comfort is given, when the rowing machine is equipped with transport wheels to get it stored easily and compactly after the training. Manufacturers use different folding mechanisms. The users of rowing machines with a water tank get a maximum of comfort. These machines are easily and comfortably placed upright without removing water beforehand and require just a space of a chair in this position. 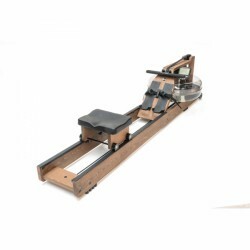 In addition, these rowing machines are harmonic in every living space due to their stylish quality made of real wood (beech, oak, ash, cherry, walnut) or high-quality stainless steel and metal. In order to benefit from many positive effects of rowing, the correct doing of the rowing technique is very decisive. 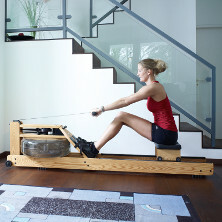 In contrast to the training with an elliptical cross trainer, where the course of motion is given to a large extent, rowing is a more demanding course of motion. When the technique is learned patiently and correctly from the beginning, a healthier, better, and quicker rowing is ensured in the long term. Please watch this training instructions for correct rowing. Here our sports scientist explains to you in detail the ideal rowing technique. Untrained sportsmen and rowing beginners should learn the basics at a low resistance first. 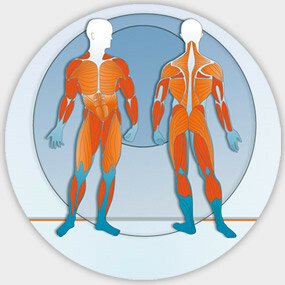 That offers the additional advantage that muscle groups - mainly of arms and legs - can get used to the higher demand.